It’s our people that make us who we are. We’re lucky enough to have some of the best names in the industry on our team. They’re creative and driven, with decades of experience across all sorts of industries and technologies. David has been with the business since 1968 and has grown it to what it is today. Over the years he’s worked on a huge array of projects and his expertise is invaluable to the team. One of the most unusual projects was carving wooden whistles for use on the tail feathers of pigeons (the client offered payment in cabbages) and the most visually striking has been signwriting a Burrell Showman traction engine. Karen returned to Cornwall to run the family business following a spell in London working for some well known companies. 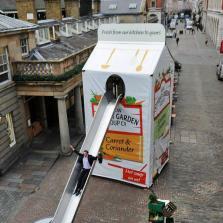 She’s built up an extensive network of quality contacts throughout the industry and is always keen to open people’s eyes to how creative the business can be – her favourite project has been working on the build of a 9m high replica soup carton for install in the heart of Covent Garden. Paul has over 30 years experience in the business. He has a strong client base, the keenest eye for detail and a love of all things heritage. Couple this with a thorough technical knowledge and it means Paul can tackle pretty much any project thrown at him; from steelwork and illuminations for Butlins to sign and interpretation schemes for The Eden Project and the Wildfowl and Wetlands Trust. Overseeing the design department, Simon is calm, organised and sees that projects head to production with every last detail specified. Skilled in 3D design, he’s a technical expert with experience in working on unusual projects in all sorts of materials – something that’s exemplified by a project he worked on for E-On, in which we used low iron glass, polished concrete, brushed stainless and polished stainless, to create architectural glass displays and a hanging sculpture. Working with Simon are Joe, Helen and (another) Simon with skills in 3D technical design and graphic design. Drawing upon 30 years experience in the business, Simon oversees the day-to-day running of the office and is the main point of contact for estimating. 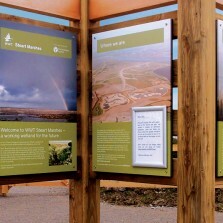 With a love of Cornish mining heritage, Simon’s favourite project were always going to be The Lode Model – a 3D relief of the Cornish coastline, which featured interactive lighting for shafts, lodes and moving parts that revealed mineral deposits and the Cornish Mining World Heritage Site visitor centre refurbishment at Minions on Bodmin Moor. Working alongside Simon are Joan and Margaret. James has worked with us for 11 years. He ensures that projects leaving the workshop are of the highest standard. James enjoys the various timber-based projects that we are asked to produce. As our resident athlete, James is a keen gig-rower and can complete a half marathon in break-neck speed. Working alongside James are Tony, David, Chris and Guy. Simon (the 4th Simon of the team) ensures the production side runs smoothly. He’s the interface from design to production and ensures that projects leave us on time. He previously worked on the install team, where his favourite projects have been working with the National Trust in Northumberland and SOAS, The University of London – both of which involved the installation of a huge array of signs, of varying sizes. There aren’t many places around the country that Andy can go without spotting something that has run through his print room. Trained in vehicle wrapping, he oversees the day-to-day running of the print and vinyl department. Along with his team he’s wrapped most things, from generators to track units and everything in between. Working with Andy are Marc, Nick and Liam.